The tournament has come to its grand finale. The match between Sarada VS Araya of the Hidden Sand has begun. 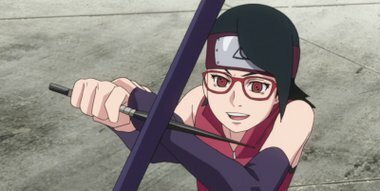 Sarada assaults relentlessly with her specialty of shuriken attacks and Sharingan. However, Araya is able to dodge those attacks without even moving, and forces Sarada into a corner. In the match between Mitsuki and Shinki, the two of them have conserved their strength in preparation for an epic showdown between them.